Now in its 10th year, the Giving Tree collaboration between Mesa County Libraries and Grand Valley Catholic Outreach seeks to help local families in need during the holidays. Giving Trees decorated with gift requests from Mesa County residents in need will be at the Central Library in Grand Junction and library branches in Clifton, Fruita, Orchard Mesa, and Palisade from Monday, Nov. 19, through Saturday, Dec. 8, 2018. The gift tags represent residents of all ages. Using a Giving Tree is easy. 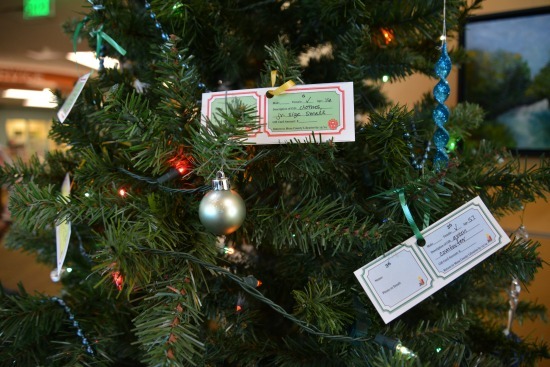 To help someone in need this holiday, stop by a participating Mesa County Libraries location and select a tag from the tree describing a gift to purchase. Before leaving the library, provide library staff with your contact information on the smaller portion of the tag. After you have purchased the gift, bring it to the library unwrapped and with the Giving Tree tag attached. Please bring the gift to the library before Saturday, Dec. 8. Your participation in the Giving Tree effort can help make a needy family’s holiday special this year. Please visit a participating Mesa County Libraries location and pick up a tag before Dec. 8.